Located in the province of the same name, Barcelona is the capital of the Autonomous Region of Catalonia and the second largest city in Spain, after Madrid, with a population of 1.6 million in the city proper, an area that encompasses 101 square kilometers, or 39 square miles. The Barcelona Metropolitan Area extends beyond the city limits, with a population of roughly 4.5 million and an area of 803 square kilometers, or 39 square miles. Barcelona is the sixth-largest metropolitan region in the European Union by population, following London, Paris, Madrid, the Ruhr and Milan. It is also the largest metropolitan area on the Mediterranean coast. 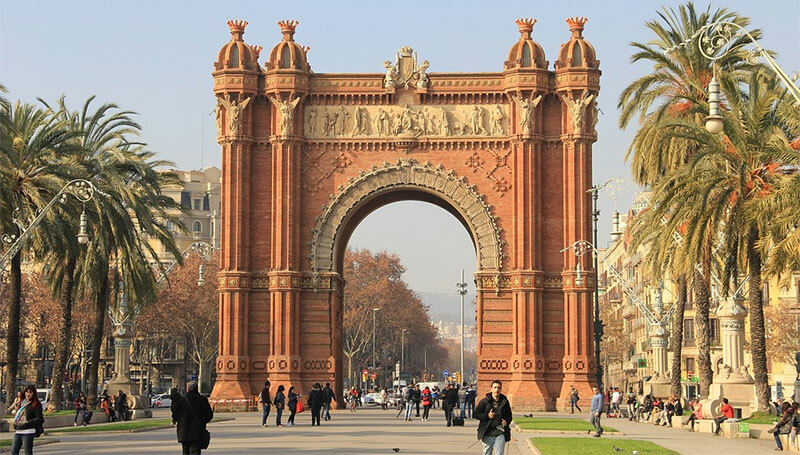 A former host of the Summer Olympic Games (1992), Barcelona is an important economic and cultural center of Spain; a city with a rich cultural legacy and proud heritage. The city is one of the world’s top tourist destinations, and its influence in commerce, education, entertainment, media, fashion, science, and the arts all contribute to its status as one of the world’s major global cities. Barcelona is home to some of the most stunning architecture in the world. In fact, in 1999 the city won the RIBA Royal Gold Medal for Architecture, the first and only time that the winner has been a city, rather than an individual architect. The city is home to scores of World Heritage Sites (as named by UNESCO), museums, parks, beaches, gardens and historical landmarks, and its culture is warm and embracing. It may be known as Spain’s “second city,” but the truth is, once you arrive there you may never want to leave. Without question, one of Barcelona’s top attractions for tourists (as well as for those who live here) is admiring the city’s modernista architecture and the works of famed architect Antoni Gaudí in particular. Just walking around you’ll undoubtedly come across various examples of Gaudí’s work throughout the city, be they government, private or religious structures. In addition to the aforementioned Sagrada Família, impressive both inside and out; there is the Park Güell, a space that seems as if it’s out of a fairy tale and emulates an English garden city; and La Pedrera. Additionally, you won’t want to skip the prospect of visiting other Gaudí buildings that are less popular from an average tourist’s perspective, such as the Palau Güell, Casa Batlló, Torre Bellesguard, Casa Vicens and (if you have time to venture a bit outside of Barcelona) the tomb of the Colònia Güell, located in Santa Coloma de Cervelló. But Gaudí wasn’t the only modernista architect who left his mark on Barcelona. Also worth a stop are the Casa Amatller and the Palau de la Música, both the works of Puig I Cadafalch; Casa Lleó Morera, the brainchild of Domènech i Muntaner; and the Casa de les Terrades. Another example is the Hospital de la Santa Creu i Sant Pau, a World Heritage Site and a place whose gardens are an oasis in the downtown core of the city. Located on Moll d’Espanya del Port Vell, just steps away from its convenient Metro stop, the Barcelona Aquarium is home to thousands of varieties of sea life, with shows and exhibits featured throughout the day. This is a great place to take the kids for a fun and relaxing day when visiting the city. Designed by the famous Catalan architect Antoni Gaudi, La Sagrada Familia is one of the top tourist destinations in Barcelona, with over 3 million visitors a year. This massive unfinished church was begun over 100 years ago, showcasing the amazing architectural styles of the past. Visiting the outside of the church is free of admission, but for those who desire to see the inside of the church, your best bet is to get reservations at least a month in advance, as the attraction is very popular among locals and tourists alike. The Sagrada Familia is a symbolic expression in stone of the Christian faith. In this temple is an exaltation of the Family of Nazareth, which stands as a model for a united family. It is also a place where Christians, especially Roman Catholics, can recognize the tenets of their faith. Likewise, those who profess a different faith or none at all can find in the Sagrada Familia some of the keys for understanding the Christian religion, among them the history of the Church, the Sacred Scriptures, the tradition of dedication to the Saints, Christian doctrine and worship. The Basilica of the Sagrada Familia is also a place of worship. Within the “open” area of the structure, in the Chapel of the Holy Sacrament and Penitence, there is a space especially reserved for worship and contemplation. Throughout the year, the Basilica also hosts masses that are open to the general public. The Nativity façade of the Sagrada Familia celebrates the birth of Jesus the Messiah, the Son of God made man. It is also referred to as the façade of Life, of Joy, or of Christmas. It is inspired by the gospels about the childhood of Jesus: Luke 1:5-2:51; Mt 1-2. Guests here can choose to visit just certain parts of the beautiful—parts that include the Portal of Faith; Portal of Hope, Bell Towers; and the Portal of Charity. The Picasso Museum is Barcelona’s most famous museum, attracting millions of art lovers each year. It celebrates the life and work of Pablo Picasso, a Barcelona native, and features a unique collection of early sketches and lesser known works by one of the world’s most renowned artists. The Magic Fountain of Montjuïc is a fountain situated at the head of the Avinguda Maria Cristina in the Montjuïc neighborhood of Barcelona, in the province of Catalonia in Spain. The fountain is positioned below the Palau Nacional on the Montjuïc mountain and near the Plaça d’Espanya and Poble Espanyol de Barcelona. The fountain, much like the other structures that surround it, was first constructed for the 1929 Barcelona International Exposition. The Magic Fountain of Montjuïc was designed by Carles Buïgas, who had designed illuminated fountains as early as 1922. The site where the fountain was constructed was the previous location of The Four Columns. The columns, representative of the Catalanism movement, were demolished in 1928 under the orders of Prime Minister Miguel Primo de Rivera and were rebuilt in 2010, just a few short meters away from the original location. Buïgas submitted his design a year before the exhibition, with many calling the plan too ambitious, with too little time to complete. The construction project utilized over 3000 workers. The first show took place on May 19, 1929, the day before the start of the Exposition. The fountain was badly damaged in the Spanish Civil War and did not operate until 1955, after Buigas oversaw the much-needed repairs. In the 1980s, music was incorporated into the light show and the fountain, along with the Museu Nacional (National Museum), was completely restored prior to the 1992 Summer Olympics, held at Montjuïc. Performances at the site include film, classical, and modern music, such as The Godfather, The Lord of the Rings, Gladiator and other movies, a Spanish zarzuela movement, “Barcelona” by Freddie Mercury and Montserrat Caballé, and modern pop songs. Performances take place at half-hour intervals every weekend, with weekends extended during the summer season. FC Barcelona is one of the world’s most well-known and most successful football (soccer) franchises of all time. At the FC Barcelona Museum, located adjacent to the large stadium that hosts the team’s home games, visitors can see trophies of past championships, memorabilia, player’s jerseys, and read biographies of their favorite players, both present and past. They can also become familiar with the stadium and the many world events it has hosted during its tenure, including the Summer Olympic Games in 1992. The Barri Gòtic, or Gothic Quarter, is one of the oldest parts of the city. Here, travelers can explore the complex architecture and charming nostalgia of medieval-era Barcelona. The quarter contains many of Barcelona’s most esteemed architectural landmarks, including La Seu Cathedral, the seat of the Archbishop of Barcelona, and the Plaça Sant Jaume, the neighborhood’s central plaza. Located near the city center, Barri Gòtic is also filled with small cafés, perfect for people watching; bars, ideal for sampling Spanish beverages; and alleys, sprinkled with shops ranging from espadrille makers to contemporary stores like Mango. You’ll also find several street performers scattered throughout the quarter’s backstreets and squares, which provide an excellent soundtrack to a morning or evening stroll through the neighborhood. Barcelona’s Palace of Catalan, or Palau de la Música Catalana, is a vibrant example of the Art Nouveau style, designed by architect Lluís Domènech i Montaner. While the exterior may seem dreary compared to Gaudí’s flashier designs, take a closer look and you are sure to find that this UNESCO World Heritage Site also has a few eccentric qualities of its own. Here you can snap a few photos of the intricate mosaic pillars and sculptures depicting such famous musicians as Bach and Beethoven. The interior of the palace is just as beautiful, complete with artistic representations of popular Catalan music. Before you move on, make certain to seek out the sculpture of the flowery women of Lluís Millet’s song, Flors de Maig (“Flowers of May”). Additionally, you won’t be able to miss the massive stained glass central skylight — a light that protrudes from the ceiling, providing the concert auditorium with ample natural light. Throughout the year, the Palace of Catalan Music — located in the Old City — hosts both classical performances as well as contemporary concerts featuring popular Catalan artists and rock groups. Tickets are available at the Palace’s box office. You can also take a tour of the Palace; guided tours are offered daily for €17 EUR (or around $23 USD), and you should reserve your place ahead of time.